Toki Doki is a Japanese Lifestyle brand which was originally designed by an Italian designer in the USA. This has now been converted into a theme for this 5 reels, 3 rows and 40 fixed paylines slot by IGT. Visit this town with a minimum of 60p a spin. The random multipliers, cash prizes, the Reel Reveal Feature make it more interesting and profitable as you move on with Toki Doki Lucky Town slots. 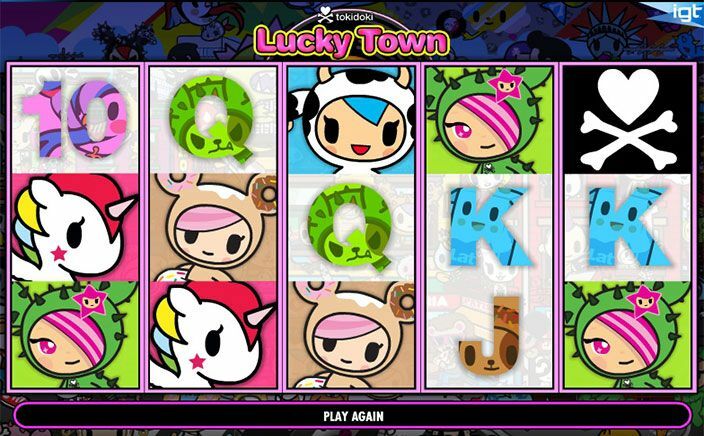 Meet the colourful and wonderful townsfolk in Toki Doki Lucky Town slots. All the cute and wacky characters appear on clothing, shoes and accessories for kids and so are the main characters of Toki Doki Lucky Town which are quite bold and bright. The background is blue in colour with rich sound which can be easily muted. Place your bets to visit the town, you just need to have 60p in your pockets but if you want to win big then place the maximum bet of £600 per spin. The slot contains very cute and colourful characters inspired by the brand itself which are the high-value symbols of the slot and the low-value symbols are 9, 10, J, Q, K and A in white background. There is an abundance of bonuses and multipliers in the town. The town has two wild symbols. The first is the black-and-white heart and crossbones which substitutes for all symbols. The second is the yellow-and-black heart and crossbones which can substitute for regular symbols and comes with a multiplier of 2x. 1st Revealed Real – Activated when the Wild symbol Lady Caramella appears anywhere on the 1st reel and will turn up to 3 regular symbols into Wild. 2nd Revealed Real – Activated when the Scatter symbol Truffle appears anywhere on the 2nd reel and will award you different multipliers from 2x to 15x. 3rd Revealed Reel – Activated when the unicorn Pogo appears anywhere on the 3rd reel and turns the two adjacent positions to wild. 4th Revealed Reel – This is a pickup round in which you will be taken to a new screen and you have to pick a milk carton which has hidden prizes of up to 10x of your total bet. 5th Revealed Reel – When any one of the characters appears on reel 5 then all the matching symbols on reels 1 to 4 become wild. 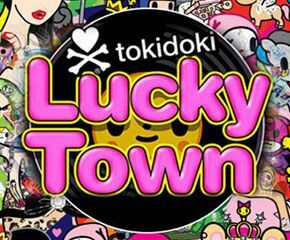 Though the sound effects and the graphics are not so attractive, still this simple looking Toki Doki Lucky Town slots offers huge bonus features which will help you win big. This slot is playable only on desktops, so try this out as soon as you can.